Shop Stauer online at Stauer.com for Watches Fine Jewelry, Mens Jewelry, Eyewear, Home Accessories, Coins & Collectibles, Fine Art Paintings, Handbags & Leather Goods and much more. Save on your next purchase from Stauer.com with Stauer discounts, Stauer coupons, Stauer promotions and Stauer savings from 58coupons.com. Use this promo code to save $25 on your purchase of $150 or more from Stauer.com. Click the link to see the code and remember to enter it in the promo box at checkout. When you sign up for the Platinum Club at Stauer.com you'll get a $100 gift certificate, 10% savings on your order and a free gift (valued at $99). Click link. 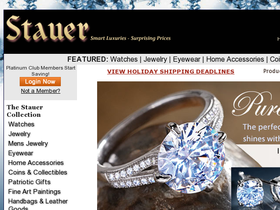 Enjoy a free gift (valued at $99) from Stauer.com when you sign up for their Platinum Club. Click link. Check out the Specials page at Stauer.com where you can save up to 80% on select Specials items. Click link to get started. For a limited time save 30% on the Superzoom Binoculars (item #19234) at Stauer - plus you'll get a free $50 gift certificate with your purchase. Click link to get started. Sign up for Stauer's Platinum Club today and save 10% on your order. Click link.